It’s the season for fairy-tale mushroom hunting. To be seen, not be eaten. The fly agaric is the quintessential mushroom of fairy tales. Its big, bright fruiting bodies scatter in great numbers across mossy forests of North America and Europe. They emerge from the soil first like white eggs, abandoned by some mysterious creature of the woods. They can grow up to a foot tall, as warts appear on the cap. The mushroom often blushes red in the process. Finally, they crack open and flatten into a polka-dot disc that would make a gnome’s perfect dinner plate. 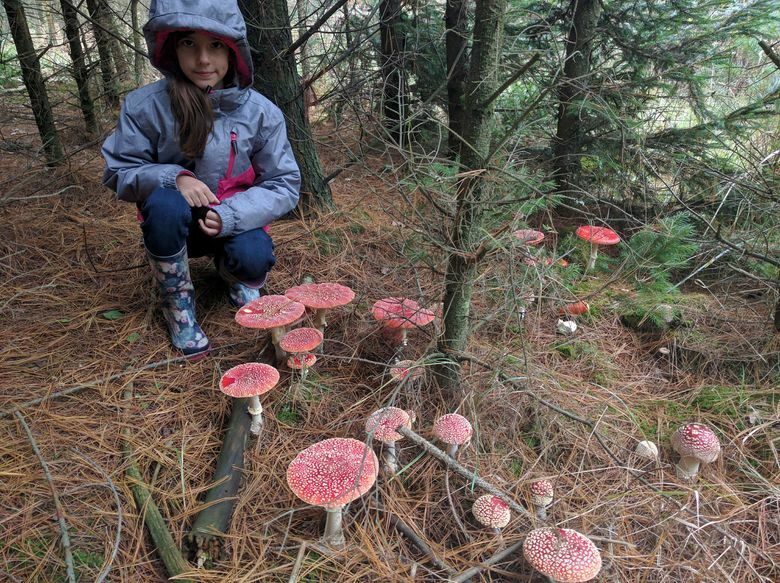 Recently mushroom hunters and nature lovers have been sharing photos of their fly agaric finds on Facebook, Twitter and Instagram. Perhaps the most striking images came from Hungary, in a Facebook post, which included a video and a photo of a mushroom as big as a child. For many Eastern Europeans, mushroom hunting is a tradition. For some, it’s also a way to earn extra cash. For Csaba Reisz, a fertilizer salesman and soil nutrition consultant in southern Hungary, it is an escape from work stress. “I make everything right with a little mushroom hunting and photo shooting,” he wrote in an email. A few times a month, he wanders the forest looking for fungal beauty and shows his children the best finds. Between September and November in his area, Csaba often finds the fly agaric, scientifically known as Amanita muscaria, like a patch discovered Oct. 9. “I found the fairy in the fairy-tale forest,” he wrote in a photo caption. These giant shrooms typically pop up in acidic soils near spruce, oak or birch trees when they get enough rain. While Csaba admires them, he probably will not be feeding these magical-looking mushrooms to his children. They contain two mind-altering neurotoxins called ibotenic acid and muscimol, which are known to affect humans and other animals. They are called the fly agaric because in some places, people lace milk with bits of it to lure and kill flies. The insects become inebriated, crash into walls and die, according to the blog of Tom Volk, a mycologist at the University of Wisconsin, La Crosse. Strange things can happen when mammals ingest them, too. In January, news reports suggested that eating fly agaric fungi made fearless coyotes terrorize motorists in the moonlight in California. Reindeer historically have tripped on them, too, and in some places, fly agaric has even been associated with Christmas. Some historians even chalk the victories of Viking “Beserker Warriors” to the fearlessness induced after ingesting Amanita muscaria. In studies using rats, muscimol was infused into parts of the amygdala, a brain region that is known to process emotional fear memories in humans. The drug shut down the rats’ ability to learn about and respond to threats. But in humans, it can also do the opposite. Its effects range from dry mouth and rapid heartbeat to euphoria, hallucinations, feeling closer to God and fear. Incorrect doses or preparations are poisonous. In at least one case, doctors found the fly agari in the stomach contents of a person found in a coma. Additionally, Amanita muscaria are often confused with relatives: deadly impostors known as the death cap and the destroying angel. Csaba thinks that maybe the mushrooms he found were able to get so big and numerous because of recent weather, and that other locals, seeking them for their psychoactive properties, had not yet picked them. If this fairy tale now sounds like a nightmare, then look, but do not ingest.